Mirror, Mirror…Who Loves You Most of All? Esme wants to move to Lake Placid. Desmond and Josephine ran carefree and barefoot — perhaps the only ones who did — in the Ironkids Fun Run along Mirror Lake Drive. We went to Lake Placid. We were in close quarters, we spent too much on food, the first night was chilly and we didn’t have the right clothes. The children were tough — tough to deal with and tough on each other. Then they toughed out a really long, rainy day while Papa rode his bike all around and ran out of town — twice. And, it was wonderful. It is my hope that it became part of the lore of our tribe. We embraced it all — from the top of the ski jumps to bottom of the holes dug on the sandy beach. We gave Lake Placid a big hug and it hugged right back. How much do we love you? This much! 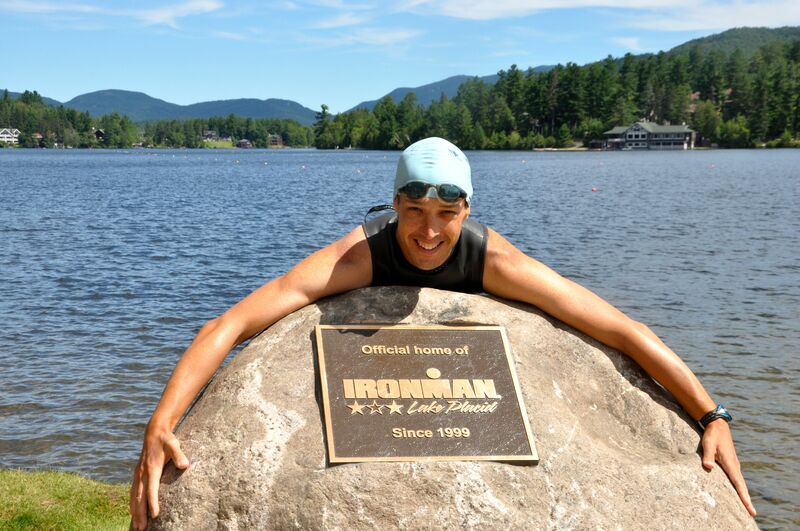 There is much to share about the Ironman experience. Obviously, the swim, bike and run must be recounted. The new speedsuit by Roka should be reviewed. Notes on nutrition, pacing and heart rate must be catalogued. Observations — like the cooler next to the side of the road around mile 35 with a hand printed sign that announced “FREE BEER” or the increase in the number of Jens Voigt inspired signs I saw along the route — can be shared. The mantra-like focus I relied upon for most of the race and my feeble efforts to explain it to the kids over Ben & Jerry’s Ice Cream after the race. But all of that later. First, the down and dirty of how it all turned out according to the clock. Finished 140.6 miles in 10:32:51, 27th in my age group out of 294 finishers and 143rd overall out of 2,348 finishers. The improvement from 2012 was 1 hour, 12 minutes and 10 seconds from when I finished 73rd in my age group and 365th overall. The 2013 swim was one second faster than 2012. The splits are nearly identical also. The two 1.2 mile swim splits were 25:50 and 27:18. The first loop was two seconds faster this year and the second loop was one second slower than the second loop last year. Although, more should be said, I think that I worked about 50 percent more than last year on the second loop. It was a madhouse. The 2013 bike split was 27 minutes and 9 seconds faster than in 2012. I went around the course in 5:34:01 or an average pace of 20.12 miles per hour. 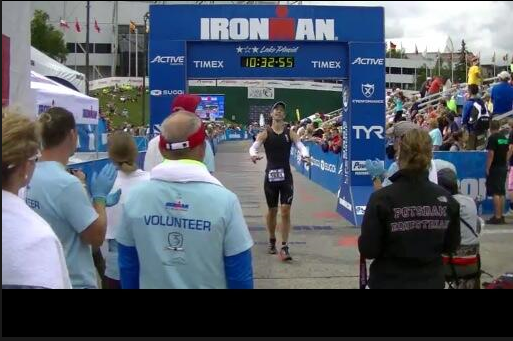 I finished the bike in 17th place for my age group and had slid back to 85th overall. Last year I was in 49th and 212th position at this juncture of the race. The marathon was 45 minutes and 59 seconds faster this year. I ran a 3:56:33 for an average pace of 9:01 minutes per mile and though I have not looked at all the data from my watch yet, I believe that only once did I split a mile over 10 minutes. In 2012 I ran a personal best at this distance and did the same course in 4:42:32. This year both of my transitions — from swim to bike and from bike to run — were slower than last year. The first was :18 seconds in arrears and the second was :41 seconds slower. I had just raised my arms to use sign language to say “I love you” but they were too heavy and drooped immediately back down. The link to the swim start is no good. The link is fixed. I needed some technical help from colleagues at work.